Recognize that cheeky socialist rat painted on a wall with a thought-provoking message from your Tumblr feed? Of course you do, you reblogged it! The artist of that rat is Banksy, an anonymous (and by default, mysterious) street artist whose art happens to piss off a lot of people. “Saving Banksy” is a documentary centered on an art collector’s attempt to save Banksy’s famous “Haight Street Rat” from being auctioned off. Faced with threats from city officials and outrageous offers, this art collector has to decide whether this fight to protect Banksy’s art is worth giving up for some serious cash. “Saving Banksy” is a rare, insider look at the mysterious world of street art and graffiti. Here are four reasons to watch it during its run at the Hipp — on June 12 and June 19! Don’t worry, we want an HBO series about Banksy’s real life, too. For now, though, we’re gonna have to deal with the fact that his or her life is an absolute mystery to us, which we’re also really into. P.S. Banksy, if you’re reading this, we wouldn’t mind a certain rat on our beautiful building. P.P.S. : Just not on the limestone, please? Stick it to “The Man,” amiright? This documentary not only gives you an inside look at the street artist’s perspective but also “The Man.” Who is “The Man”, you ask? No, it’s not your parents, although it was so messed up that they didn’t let you go to that party that one time. “The Man” is essentially corporate America and the people who are only seeking financial gain from street art. “Saving Banksy” provokes you to ask yourself if you’re on the street artist’s side of this feud or if you’re lame and don’t appreciate street art for what it is. “‘Saving Banksy’ is not a movie about Banksy,” executive producer Brian Greif said. “It is a movie about the importance of the street art and graffiti movements. History will mark these as among the most important art movements.” We are beyond excited to welcome Brian to the Hipp on June 19, following our “Saving Banksy” screening. This is HUGE, y’all. Brian Greif is an art consultant and documentary film maker who has worked on a variety of projects including gallery exhibits and mural projects with some of the top names in street art and graffiti. Through his company 2:32 AM Projects, Greif has coordinated major murals by international artists: Rone, Herakut, Curiot, Above, Niels “Shoe”Meulman, Guido Van Helten, Jason Woodside, Ian Ross and more. 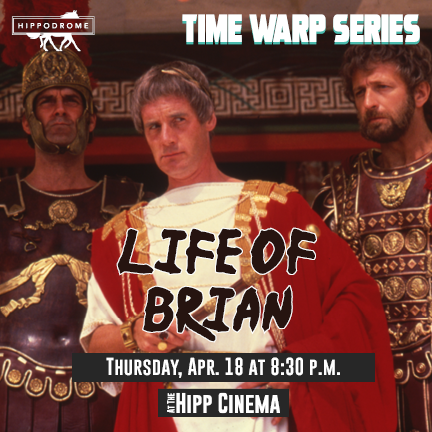 TL;DR: Brian Greif is a really big deal, and you have the chance to meet him and ask him questions at the Hipp! 4. Poses the question: What would you do if someone offered you a small fortune for a painting the artist didn’t want sold? Uh, sell it? KIDDING. Artistic integrity is a real thing, folks! It is so awesome to watch the artists in this film who are so passionate about their craft that they don’t even care about getting money from their work. Bring your friends to watch “Saving Banksy” at the Hipp to see who ranks number one on the biggest-sell-out list. You get to judge your friends’ choices AND it’s fun! Get your tickets by visiting thehipp.org or calling (352)375-4477.